Hello Everyone. I am excited to Guest Post this week for Jessica while she is on vacation with her family. Allow me to introduce myself: My name is MaryAnn Perry and I am a wife to a firefighter and momma to two precious little girls who constantly keep me on my toes with their curiosity and wild imaginations. I am a photographer and write a little blog called CherishEveryday. Everyday is busy and full of wonderful and challenging moments that bring growth and happiness into our lives. Ordinary days filled with special moments I don’t want to forget. My scrapbooking time is limited, and Project Life simplifies how I document my life and preserve our family memories. Without Project Life I wouldn’t have the time to document or scrapbook our family memories. Project life has literally revolutionized the way I scrapbook. I am passionate about Project Life. 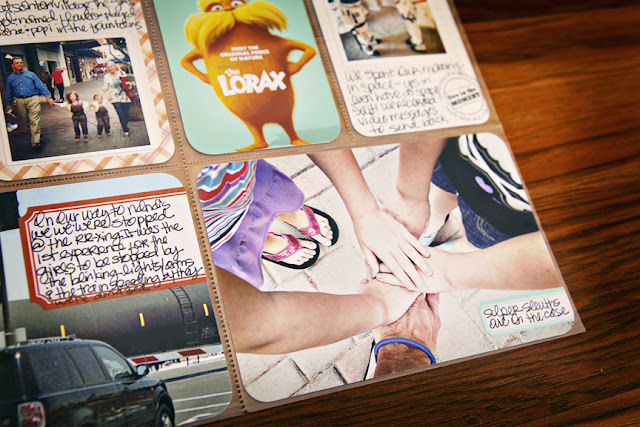 Project Life tells my story…. about my family and life from my perspective. For me, it is a reminder to pick up my camera and capture the everyday. The focus is on the little ordinary everyday moments that make my life so wonderful. It is a place to record the funny things that my girls say, or a place to put a note that my husband left for me. 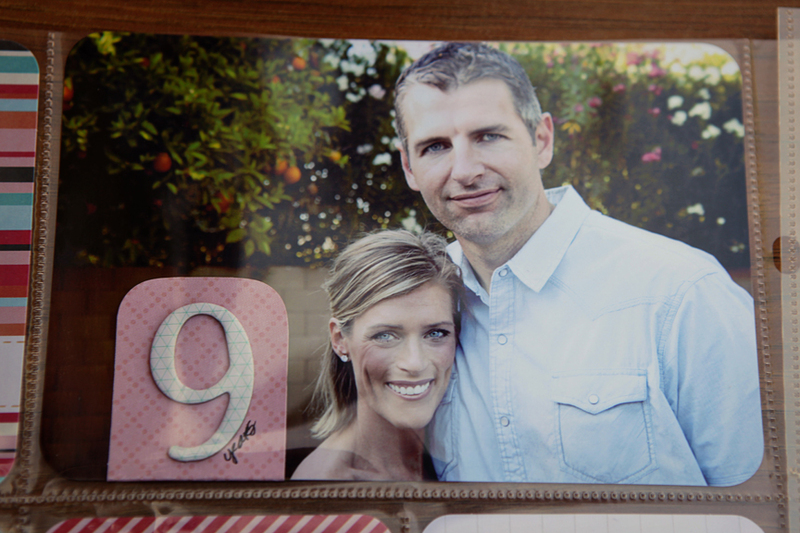 It lets me bring a favorite photo that Grammy took while the girls were visiting her house, and mix them with receipts & drawings and ticket stubs. 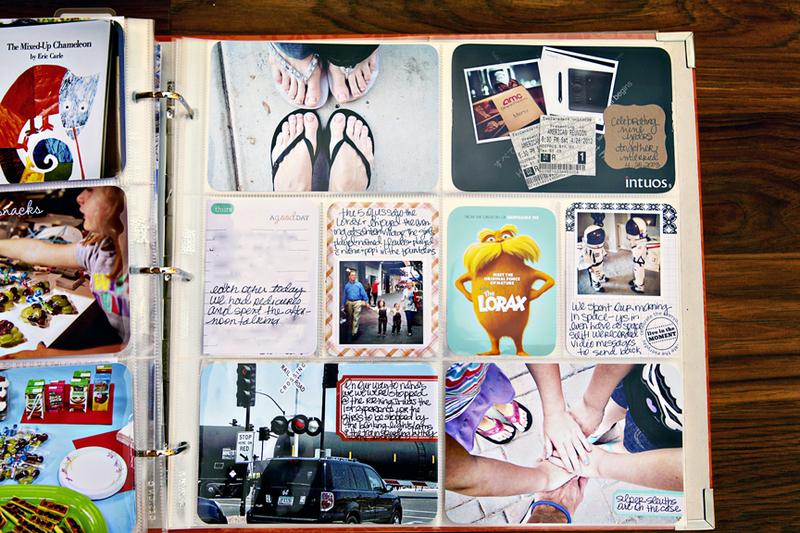 It tells a story about our lives that most of my old scrapbooks never did. I love looking through my albums. I love watching my girls look through the albums. I love seeing people get interested about Project Life and that makes me love it even more!!! At the end of 2011 Becky Higgins asked me to be part of the Project Life Creative Team and I was beyond ecstatic to join the team. This will be my third year completing Project Life. My only wish is that Project Life would have been around years ago. I’m sharing week 17 with you…..for each of you it is week 18….yes I am a week behind…but thats okay…because with Project Life there are no rules and we work at our own pace. And if I’m being honest last week was a rough week and while I have pictures I just wasn’t ready to deal with putting it all together yet…. so I’m giving myself some time for healing and then I will go back to it. Overview of week seventeen. 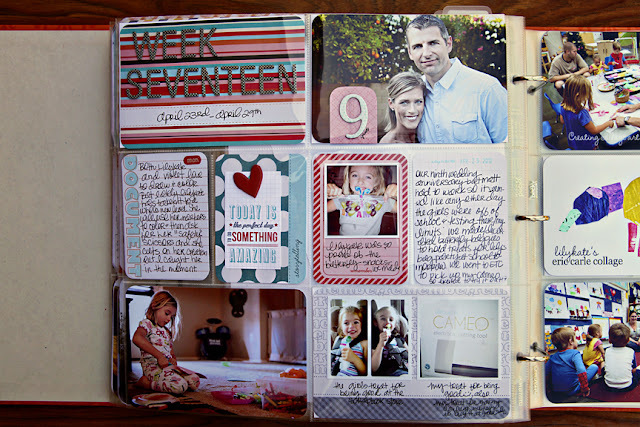 I use Becky Higgins Photo Pocket Pages Design A as my base pages for each week and vary my insert pages with different photo pocket designs. Close up of first part of the week. Insert is Becky Higgins Photo Pocket Design C trimmed in half. All photos corner rounded. Close up of the second part of the week. 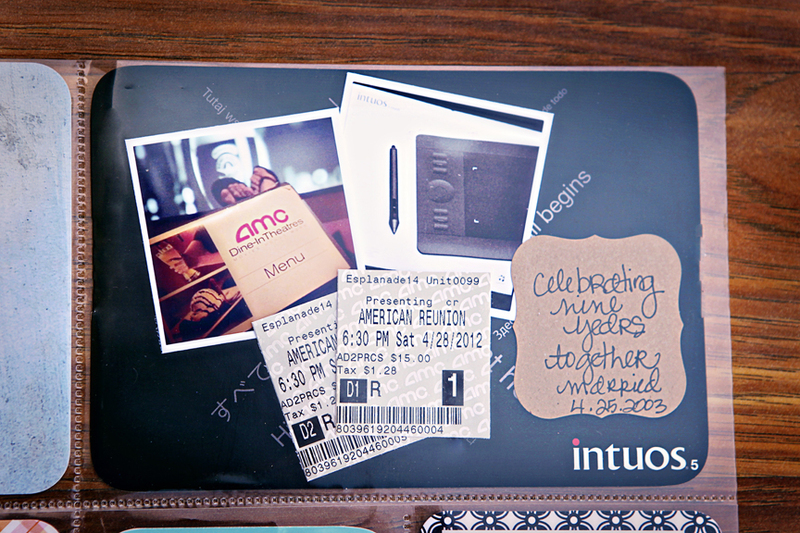 For this photo I used a couple of instagram pics and movie tickets from our anniversary date night. The background paper is actually a postcard that was in the gift that my husband gave to my on our anniversary. I used a bi-fold journaling card, but still had more to say so I used another 3×4 journaling card and just stuck it in between the bi-fold card. I love the new line of Martha Stewart Labels at Staples. The colors are fun and compliment all of the Project Life Collections. Adding a label gives me a little bit more room to tell another piece of the story! So that’s it… week Seventeen. Thank you Jessica for having me and I will leave you all with this thought….Project Life is designed to SIMPLIFY the memory keeping process… don’t over think it. 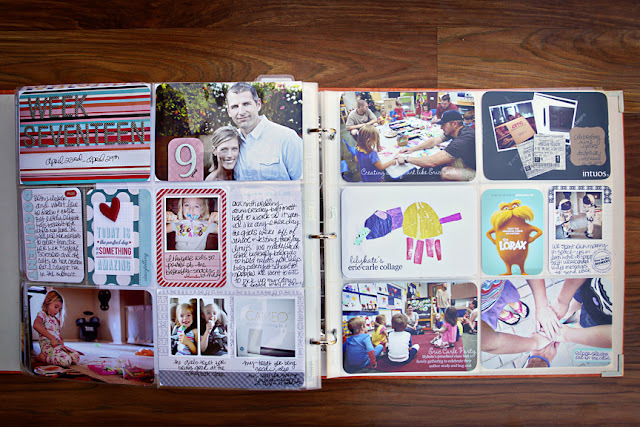 You make the rules….it’s your album….there are no Project Life Album Police. Make it work for you, so you can be successful! I love your pages MaryAnn. 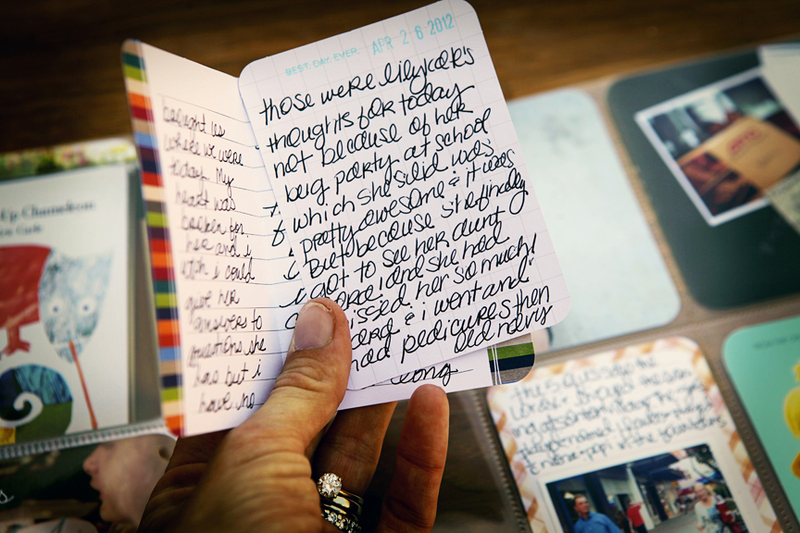 Your handwriting is gorgeous, as are your photos and the end result is just magical. 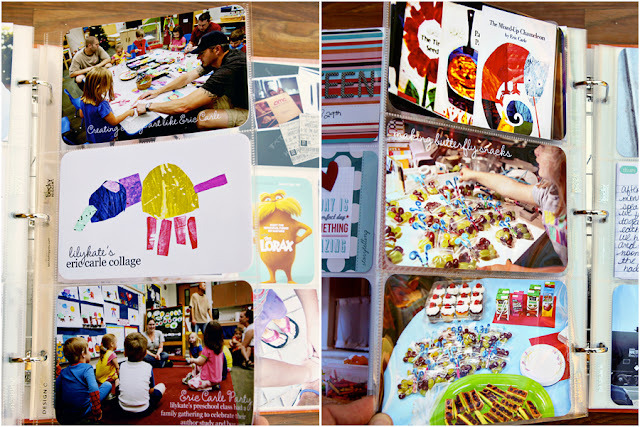 Thanks for sharing your fabulous pages with us, MaryAnn. I love what you say about no Project Life police – that’s one of my favourite things about PL is its flexibility. I adopt a monthly approach, generally working out to a single page a week, and that suits me just fine! How fun it was to see your pages and read your thoughts on PL. I love the pages and the special touches you give it. Keeping it simple and doing what makes you happy with PL is what makes this sooooo awesome. My pages are weekly which works best for me. Thanks for sharing with us and Congrats on being a guest here today. Thank you for sharing, MaryAnn! 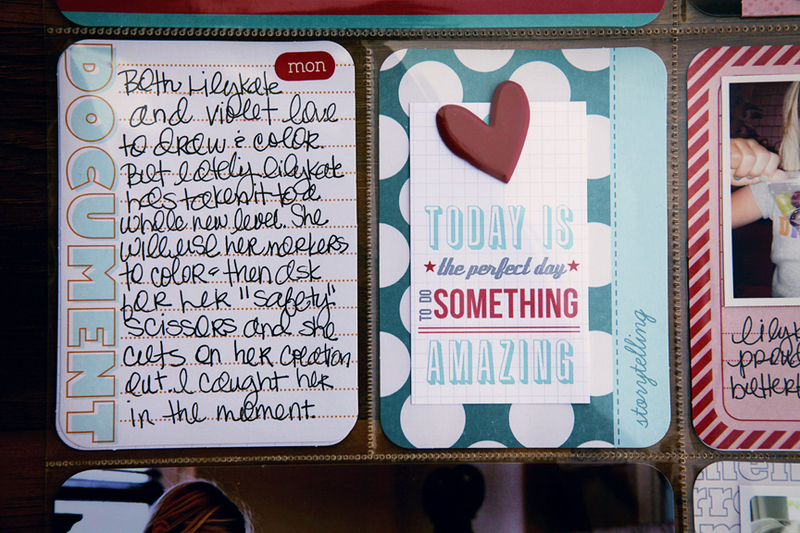 I love those Amy Tangerine thickers – I actually used the white version in my own layout this week! I love your PL pages, thank you for sharing. I was wondering how you got that small photo of The Lorax…so cute.